Are You New to Nevada? 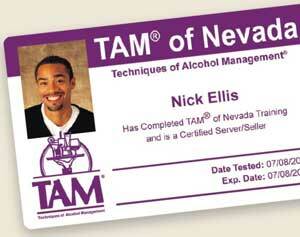 You Must Complete a Nevada-Specific Alcohol Awareness Class – TAM Card® Nation in Vegas! Are you new in town and hoping your out-of-state alcohol awareness card is valid for your new job in Las Vegas? Don’t put yourself or your employer at risk, alcohol education cards from out-of-state won’t transfer in Nevada. Industry professionals should complete alcohol awareness training with TAM® of Nevada to meet local requirements. Workers are drawn to this great state for its booming entertainment and nightlife industry, and all of the hospitality jobs that come along with the action. We often receive inquiries from out-of-state students asking if their alcohol education cards and education are transferable in Nevada. Why repeat training if it’s unnecessary? Unfortunately, liquor laws are specific to the states, counties and municipalities, so no, alcohol licenses are not transferable. You will need to take another alcohol awareness course here in Nevada before you begin your career. All individuals hoping to work in the beverage sales and service industry in Nevada must complete an alcohol training program that has been approved by the Nevada Commission on Postsecondary Education. Furthermore, check with your employer, in many cases an official TAM® brand card is required. TAM® of Nevada is an approved provider, and the only official provider of TAM® Cards in the state of Nevada.